Tradition has never been clearer than a ring and a rose. Click here to play! This incredibly exciting slot will have you pining for the days of traditional slot machines, so get on board and start winning massive payouts today. Rings and Roses is a colorful 3-reel slot played across five pay lines, where the more lines unlocked allows you greater opportunities for winning payouts. There are no Scatters or Bonuses to distract you from winning, with the Wild the most lucrative symbol on the reels. The Rings and Roses symbol is Wild and can be substituted for any other symbol on the reels in order to complete winning combos. Whenever you earn three Rings and Roses symbols on an active pay line, you will receive a massive payout anywhere from 1000 coins, up to 6000 times your original stake! The Rings and Roses are paying out in abundance, so head down to this classic slot machine today to start winnings! 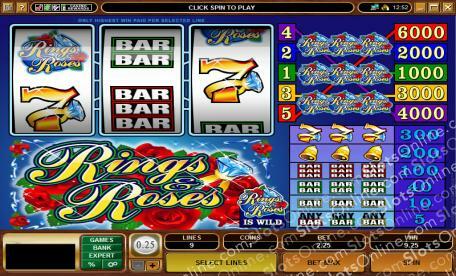 The Rings and Roses symbol is Wild and can be substituted for any other symbol on the reels to finish winning combos. Payouts are up to 6000 coins.